Those who may be concerned that Westworld is going totally off the rails can rest a little bit easier, as co-creator Lisa Joy says they have a definite ending in mind for the series. 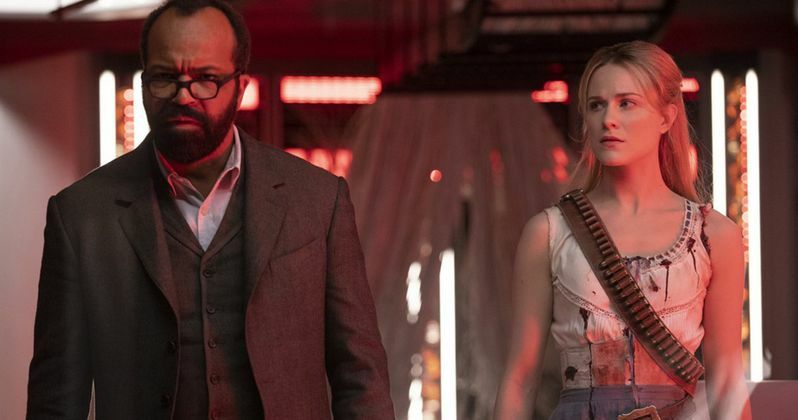 Westworld season 2 recently wrapped up its run and, while there are still plenty who love the crazy sci-fi robot revolution unfolding, quite a few fans and critics have started to sour on the series. Some have wondered if Joy, Jonathan Nolan and J.J. Abrams are just making it up as they go along. However, in a recent interview, she assures that isn't the case. Warning: spoilers ahead for Westworld season 2. At the end of the latest season, most of the hosts from the park met their demise, with Dolores and Bernard out among the human population. It was a twisty, messy road getting to that point and some of the narrative, which at times got pretty muddy and confusing, started to feel a little bit like they were just throwing stuff at the wall. Lisa Joy can't totally dispel the notion that the show may have gone a little off the rails, but she does assure us that they've had an endgame in mind since the pilot. Here's what she had to say about it. "We have an ending in mind; we've had it from the pilot. It's very emotional, I think. I can't tell you exactly when that ending will come...but I think for every season what we try to do is tell a chapter of the story that gives you closure and then opens a door to a new chapter...The overarching question of the series is, what will become of this new lifeform? So I feel it would be irresponsible to not have an end goal in mind." So there's that at least. There is going to be a pretty significant gap between seasons once again, but HBO has already given the green light to Westworld season 3. Some of what we're going to see has been firmly put in place, but viewers who are still on board have an awful lot of questions. Lisa Joy also recently addressed a little bit in terms of what we can expect next season, promising that it's going to be a totally new experience. "It's going to be a whole new world...This series is about reinvention and scope. The first season was a more intimate look at the park from within the loops. In the second season, the hosts broke out of their loops and were able to explore more of the park. In the third season, they've broken out of the park itself. We're in a new terra incognita. From the beginning, when Jonah and I were thinking about the series as far back as the pilot, we knew we wanted to explore other worlds in the park, and we also knew the one world we would start to see little glimpses of throughout the first two seasons was the real world, and that we would get there eventually, and when we did, it would be a whole new experience." Westworld season 2 saw ratings decline for the finale. Though, maybe a little break will help those who are feeling a bit cold warm up to the idea of returning to the series once again. HBO has yet to announce a premiere date for Westworld season 3, but it's highly likely we won't see it back on the air until 2020. This news comes to us courtesy of Stuff.